There is no clue on the cover or back-cover blurb that Cyberstealth is the product of a woman sf writer. It’s pure Top Gun military sf and presented as such – from the tagline “It’s not easy being the best…” to an approving puff by David Drake, and cover art depicting a handsome male lead and the latest in combat spacecraft. While Cyberstealth is more resolutely mil sf – perhaps even to the point of cliché – there is much in it familiar to readers of Lewitt’s debut, Angel at Apogee. Both feature as protagonists an outsider in an elite branch of the military, and make use of a non-Anglophone culture – Romany in this case; and it’s much better integrated than in her debut. Cargo was a Romany juvenile delinquent adopted by Bishop Andre Mirabeau, a powerful and well-respected diplomat and politician in the Collegium, a polity of worlds comprising human and alien Akhaid. As Cyberstealth opens, Cargo and his “Eyes”, Ghoster, an Akhaid, have just been transferred from their normal fighter wing to an elite group, where they will fly super-sophisticated stealth batwing spacecraft. They soon learn that there is a spy among their intake of four pilots and four Eyes. Fourways, the commandant of the training facility seems to suspect Cargo. The Collegium is currently at war with the Cardia, an alliance of breakaway worlds formed after the Luxor Incident, a terrorist attack on a holiday planet. Cargo and Ghoster had flown kraits – star-fighters – against Cardia fighters, and shortly before their transfer to the batwing group, were under investigation for a possible friendly fire incident. Cargo’s wingman, also an adoptee of the Bishop, was killed, and Cargo may have fired the fatal shot. He is cleared by an investigation, but it does make him prime suspect as the traitor. The first section of Cyberstealth, in which Cargo learns how to fly the batwing, is chiefly introduction to the universe of the story and its cast. Flashbacks detail Cargo’s childhood, and his Romany culture. He finds himself disliking fellow batwing trainee pilot Stonewall, but cannot work out why – but he does think Stonewall may be the spy. He also falls in love with Plato, another fellow trainee. Lewitt is clearly a firm believer in “show don’t tell” and throws the reader straight in at the deep end. Readers are left to puzzle out the meanings of neologisms from context, and the background is revealed piecemeal, often making the story more confusing than it would otherwise be. Lewitt had also plainly watched Top Gun a few times too often, and Cyberstealth is filled with pilot jargon – some of it obviously invented, but much of it based on the sort of dialogue found in gung-ho military pilot movies. As a result, it takes a while for the novel to get going, and the human characters often feel as alien as the Akhaid. It is also a bizarrely colourful universe in Cyberstealth. There are frequent descriptions of the spacecraft and, with the exception of the matt black batwing, most seemed to have been “burned” in various dayglo colours like yellow or purple. There are lingering descriptions of food, particularly in the sections set in the Bishop’s point of view. These make for an oddly unbalanced story, conflicting with the macho, hard sf nature of the batwings and Cargo’s experience flying them. But even that too doesn’t really fit with the Top Gun image presented by the characters. The cyber- in Cyberstealth refers to the “Maze”, the neural interface by which the pilots fly their craft – and interact with their alien crewmates. Lewitt’s Maze is not as clumsy a metaphor as Cherryh’s in Voyager in Night, but the cyberpunk-ish edge to what is essentially a routine Sierra Hotel pilot space opera story never really quite gels. There are things to like in Lewitt’s fiction: she builds interesting worlds for her stories, her prose is usually good, and she puts interesting spins on somewhat clichéd stories and situations. Her refusal to explain does mean her novels need to be initially taken on trust more so than other writers, but it pays off – her novels are very immersive. Cyberstealth reads like an early work by a writer who was clear from the start how she wanted to tell stories, but still needed more practice in successfully putting the various parts together. It’s perhaps too much like space opera to appeal to fans of military sf, and not quite polished enough to appeal to fans of space opera. It was followed by a sequel, Dancing Vac, and SN Lewitt – eventually using her full name, Shariann Lewitt – then went on to write some very good sf novels. As an object, Angel at Apogee the paperback says several interesting things. The author is given as SN Lewitt, thus disguising her gender. (In fact, from her seventh novel, 1995’s Interface Masque, Lewitt began using her full name, Shariann Lewitt.) The cover-art features an advanced jet fighter and the tagline “The Hottest Pilot of Them All…”. It all seems designed to suggest this is a military science fiction novel, written by a male author and aimed squarely at male readers. The back cover blurb, however, reveals that the title character is female, and suggests that the plot of the novel is not the testosterone-infused future combat tale implied by the front cover. Further, there is a quote from Andre Norton. Angel at Apogee is actually a heartland sf story about a young woman who, in an effort to protect her own interests, discovers the truth about herself, her world and her people. Gaelian YnTourne may be a space-fighter pilot (a cadet, in fact, as the novel opens), but she is also heir to one of the most powerful families on the world of Dinoreos. She is also something of an outsider. She was born and spent the first seven years of her life on the primitive planet of Cahaute while her parents were on a survey mission there. Her relatives, however, are not entirely convinced she is fully of their blood – her mother died on Cahaute, and they suspect her real mother may have been a native. The Dinoreosans are a nasty lot. They have several grades of aristocrat, in order of precendence Ot-tan, Li-tan and Sonna-tan. Everyone else is a commoner and beneath notice. The YnTourne are Ot-tan. They also have a seat on the Board of the Protectorate. Dinoreos is a corporate oligarchy, and the consortium that is the Protectorate controls the entire planet and a second world, Adredri. All Adredri are considered no better than commoners. Cahaute is the only other planet known to Dinoreosans, and it is inhabited only by small tribes plainly modelled on Native Americans. It is the Protectorate’s plans to exploit Cahaute which drives the plot of Angel at Apogee. While Gaelian is set to inherit the YnTourne seat on the Board, her grandmother, the current holder, doesn’t want her to. She’d much rather Gaelian’s cousin, Dobrin, did so. So, while Gaelian is determined to fight for her inheritance, she’d much rather be a pilot – and she’s the very best at the Academy. The only person close to her is Golran, but he’s a commoner (one of the rare ones allowed entry to the Academy). Any kind of relationship with him is deeply frowned upon. Gaelian is already affianced to Teazerin YnSetti, who is clearly a nasty piece of work, arrogant and sadistic. Gaelian overcomes her first hurdle – her family position – quite quickly and relatively (no pun intended) easily. She never wanted that seat on the Board anyway, Dobrin can have it. And he’s a good sort really. But then Gaelian’s piloting career comes a cropper when she is waylaid and kidnapped by the Adredri, who, it transpires, secretly have technology the equal of Dinoreos. And on Cahaute, a Dinoreosan base camp, commanded by Teazerin, is having trouble with restless natives. In Gaelian, Angel at Apogee has an engaging heroine; and she later proves to be more than she appears to be – it is her Cahaute blood – and so is firmly within sf’s custom of featuring protagonists with super-human or near-messianic abilities. In Gaelian’s case, these abilities are linked directly to the secret history of Dinoreos, Adredri and Cahaute. The setting of the story also has its appeal. It seems a curiously confined space – it’s not made clear if the three worlds are part of the same planetary system, though in effect they might as well be. The cultures of the three are drawn well – one of the highlights is Gaelian’s witnessing of an annual religious festival on Adredri. However, the depiction of the aristocracy on Dinoreos is somewhat troubling. Initially, it seems the four sectors of Dinoreosan society have racial roots, with the Ot-tan historical conquerors of the others. Later, it is revealed that Dinoreos was settled by a single race. But there is still a nasty streak of bigotry in the attitude of the Ot-tan to the other Dinoreosans, the Adredri and the Cahautans. This is amply demonstrated in an Academy “honor court” incident witnessed by Gaelian early in the novel. Important to the story, and to the culture of Dinoreos, is the game of nerris. This is played in a court with a wall each of black, red, blue and yellow. A specific strategy is associated with the team defending each colour. The game is played with a stick, which has a blunt end and pointed end. The stick is also barbed. Drawing blood is considered a part of the game. The stick too is often used as a metaphor in Dinoreosan society. Unfortunately, it’s not entirely clear exactly how nerris operates, and its use as metaphor – especially playing “as blue” or making a “yellow play” – in interactions between the characters does little but confuse matters. Angel at Apogee is a good, solid sf debut. It’s a fun read from start to finish, with a likeable protagonist, an interesting setting, and a resolution that satisfies. Following it, Lewitt wrote a military sf duology similar in broad form to Angel at Apogee, before moving onto sf novels less obviously positioned as military sf. Her last novel was Rebel Sutra in 2000 (see here). Shariann Lewitt’s first three novels were far-future semi-militaristic science fiction, with more of an emphasis on alien societies than on Big Guns, Fast Ships and Weapons of Mass Destruction. They were notable for being well put-together, slightly off-centre examples of a well-populated sub-genre. Blind Justice, however, the first of Lewitt’s books in a new mode, was something different. In that novel, Lewitt took as inspiration a society from present-day Earth and used it as backdrop for a solidly science fictional plot. In Blind Justice, it was French, or more accurately New Orleans French. Brazilian society featured in Songs Of Chaos. In Memento Mori, it was Viennese coffee-shop society; and in Interface Masque, it was Venice. Lewitt’s last novel, Rebel Sutra, takes as its inspiration Indian mythology. Della is one of the Changed, a genetically-engineered elite which rules Maya, an inhospitable planet. They are the only segment of the world’s population which can interface with Maya’s controlling AI, the Exchange. They live in pampered seclusion in the Dome. Nearby is the city of Babelion, in which the bulk of Maya’s population live. They are basic human-stock. Each year, a group of gifted humans from Babelion are tested by the Changed to see if they can be admitted to the Elite. The test is meaningless: none of the humans ever pass. Arsen is one such human from Babelion. He meets Della. Despite the gap between them, they have an affair, and Anselm, their son, is born. After failing the test to join the Changed, Arsen returns to Babelion and foments rebellion. He is captured and executed by the Changed after leading a peaceful revolt against the Changed. Rebel Sutra then becomes Anselm’s story, as he leaves his mother and tries to pick up where his father left off. Complicating this is a vast empire, wracked by civil war, in the story’s background. The Empress cloned herself generations ago, and avatars of her have successively ruled ever since. But a prince broke away from her rule, styled himself the Pretender, and attempted to take the Throne. He succeeded, and subsequently cloned himself. Clones of the Empress and the Pretender (who is on the throne during the period in which Rebel Sutra is set) have battled for supremacy ever since. The links between Rebel Sutra‘s story and The Ramayana are plain, though Lewitt’s novel is by no means slaved to its template. If you consider the Empress and Pretender as gods, the Empire as heaven, and Maya as Earth, then… the events set in motion by Della and Arsen do, to some extent, mirror Rama’s adventures: Rama is the son of a king and the Earthly incarnation of the god Vishnu; Della is a hidden clone of the Empress. The temptations thrown in the way of Anselm also partly mirror those of Rama. The society of Babelion in Rebel Sutra is very much Indian-inspired. The populace’s religion is Vedic. Even the world’s name, Maya, is the Sanskrit word for “illusion”. Anselm, after leaving the Dome, studies at a Vedic temple for several years. He has an informal affair with a devi, a priestess of the love goddess, Aditi. He applies the Vedic mind-set to subsequent events that occur during the story. Rebel Sutra is structured as the journals of Della and Anselm. The first third is Della’s story and tells the story of her relationship with Arsen, and his revolt and execution. The remainder of the book is Anselm’s journal, and it is here that the bulk of the plot lies. Della’s journal is, in effect, back-story. Interspersed in these two journals are brief commentaries by Auntie Suu-Suu, leader of the Tinkers, which help explain the larger picture — ie, the Empire’s civil war. The Tinkers are the remnant staff of the Imperial Science Laboratory. They had hidden themselves after the capture of the Imperial capital by the Pretender. It is Auntie Suu-Suu who sets the entire plot in motion, and whose objectives the lives of Della and Anselm are subtly guided to meet. An interesting twist to the entire story is that Della is a frankly unlikeable and unreliable narrator. Anselm says as much on several occasions. She lies and distorts the truth. He takes pains to point out that her account (her journal) cannot be considered a true chronicle of events. Auntie Suu-Suu’s commentaries also paint Della as an untrustworthy character. 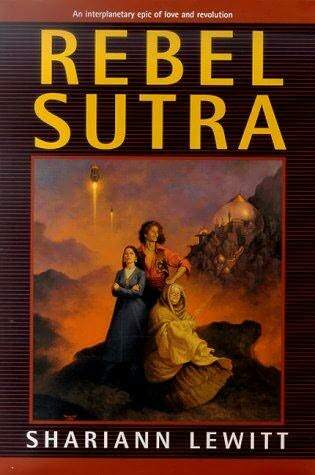 Rebel Sutra is a very good novel. Its journal structure may be initially off-putting, but it works well, and filtering a story through a character often gives a story an interesting spin. The shadowy background of the Empire also adds a welcome dimension and lifts the book above others of its type. This review originally appeared in a contribution to the Acnestis APA in 2001.